It's finished! After a few days of quilting, yesterday I stitched on the last bit of binding. I'm so very happy with how it turned out. Hopefully you all are as excited as I am - if for any reason, because you don't have to hear about this one anymore. Ha! I know I've said so much about this quilt already, but I'll touch on the main details again because I always have questions in the comments. I started this quilt over 2 years ago at a retreat put on by Pink Castle Fabrics (formerly known as Quilt Camp, now known as Camp Stitchalot). I was teaching a session on paper piecing and we were making the larger Poinsettia Star components as part of a small mini quilt pattern. I had already made the mini quilt, so I decided to play around with a new layout for all of my sample blocks. I'm sure a lot of you know how it goes - life gets busy and your UFO pile grows and grows. The original quilt section was put aside while I waited for the right time to pick it up again. That time proved to be last November. A little more than 2 months later, the finished quilt measures 62" x 75". There are 99 quilt blocks...2,610 tiny pieces of fabric. But who's counting. ;) Despite those seemingly overwhelming numbers, if you followed along on the progress you saw how this quilt was pretty achievable to assemble when broken down into steps. 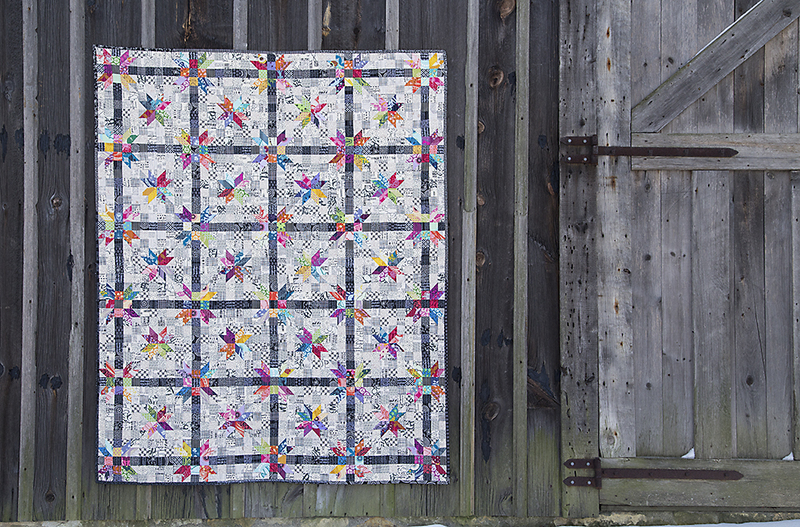 Almost every piece of bright fabric in this quilt is from my stash of fabrics by Anna Maria Horner. (I can only think of 1 piece, from the original section 2 years ago, that isn't hers.) I could gush all day about Anna Maria's talent. Her collections just sing together. The colors, the designs...they are perfect for patchwork. The black/cream fabric is also from my stash. Half yards I've collected here and there. I used a lot up for this quilt, but I certainly don't regret it. Much is from various Moda designers. A lot from Sweetwater, Lu Summers, Zen Chic. If I see it, I buy it, because Moda does not reprint fabric once it's gone. Some are text, some are shapes and lines. Together, it just works. I quilted using straight lines, just organically measuring - not marking. They are about 1/4 to 1/2 apart. And...for the moment many of you have been waiting for...a quilt pattern! This pattern is now available in my shop. I have a few new PDF patterns that I haven't announced formally, so be sure to check them out. There's the Poinsettia Quilt, Big Top Quilt and Holland Mills Quilt. Now it's time for me to go cuddle under that quilt. This one is for keeps.